Month #2 for Davemanuel.com is now in the books. We are looking forward to the fall and winter, which is generally a bonanza if you operate any kind of advertising supported website. More people are surfing, more people are clicking, and more people are buying. Everyone makes more money, from the retailers to the web site operators. Traffic is growing steadily for this blog. 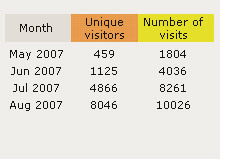 In August, we had 8046 unique visitors, and 21,006 page views. With any blog, you need to diversify your revenue streams. If you just rely on Google Adsense, you aren't going to make nearly as much money than if you try and have at least 4-5 different advertisers on your blog. Currently we have three revenue streams for Davemanuel.com. That would be Google Adsense, Text Link Ads and a private advertising deal with Yalicoo.com. In August, this blog made $168.59. I believe that in July Davemanuel.com made $65.00. It's slowly growing, and I would expect that during the fall we'll definitely break the $500 mark. 1. You have to build your traffic first. This site will be making thousands of dollars a month in a year, I guarantee it. You're not going to go from zero to $10k / month overnight. 2. This site is like a hobby. I spend probably 20 minutes a day on the site writing articles. I write about what I know, so the articles come quickly (plus I type over 100 wpm.) If I spent 20 minutes per day on this site, that means I spent about 10 hours working on the site in August. Considering the site almost made $200 for the month, that's a pretty decent hourly rate. Imagine when it is making $10k / month. 3. This site will pay us forever. As long as I continue to write an article per day and keep the search engines coming around, this site will make money, day in and day out. Rainy days, sunny days, snowy days, it will stay make money. It will make money when I am asleep. It will make money when I am on vacation. That's what operating a site like this is all about. 4. Boosting our profile. We have other businesses, and once this site is swimming in the traffic, it will boost the profile of our other businesses. This site is meant to be the ultimate experiment. An experiment to show that everyone can build a blog that pays their bills from the ground up if they work hard at it for 12 - 18 months. In a year, when someone asks how they can make money from the Internet, I want to point them to this site and say, here you go. Read every post. If I can do it, you can do it.